The B-25 medium bomber was one of America's most famous airplanes of WW II. It was the type used by General Doolittle for the Tokyo Raid on April 18, 1942. Subsequently, it saw duty in every combat area being flown by the Dutch, British, Chinese, Russians and Australians in addition to our own U.S. forces. Although the airplane was originally intended for level bombing from medium altitudes, it was used extensively in the Pacific area for bombing Japanese airfields from treetop level and for strafing and skip bombing enemy shipping. Mahogany Wood. Scale: 1/48. Wingspan 16 1/2 inches, Length 13 1/2 inches. This model is hand signed by Richard Cole who was Jimmy Doolittle's co-pilot on the first Mitchell to take off from the USS Hornet. A true collectors item! 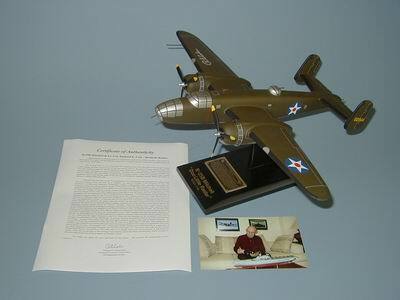 Model is signed on the top wing and comes with letter and picture. LIMITED NUMBER AVAILABLE!